Henri Rol-Tanguy (12 June 1908 – 8 September 2002) was a French communist and a leader in the French Resistance during World War II. 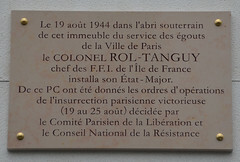 English translation: Liberation of Paris (15 August - 28 August 1944). On August 19, 1944, this building, the seat of the Prefecture of Police, was the scene of the insurrection of the Parisians against the German occupation army at the initiative of the police resistance movements. For several days, murderous fights took place around this building and in the streets of Paris, where police, firefighters and Republican guards, with their FFI and FTP comrades, were fighting the occupiers. 167 policemen lost their lives during the fighting. As the revolt is on the brink of asphyxia, a call from the Parisian Resistance is launched, as of 23 August, with the allied command to help the Paris uprising. On the orders of General Eisenhower, the Supreme Commander of the Allied Forces, and at the express request of General de Gaulle, General Leclerc, commanding the 2nd Armored Division, marched on Paris. On August 24, he sent a message, dropped by air, to the insurgents: "Hold on, we come." On the evening of August 24th and the morning of August 25th, the 2nd DB entered Paris, General Leclerc arrived at the Prefecture of Police, already liberated. 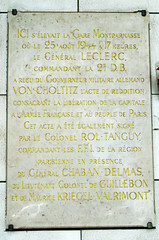 At 3:30 pm General von Choltitz, commander of the "Gross Paris", went to the Prefecture of Police where he signed the agreement of surrender of the German forces in Paris with Major General Leclerc in the presence of Messrs. Chaban-Delmas, Rol-Tanguy and Kriegel-Valrimont, representing the Resistance. This act of capitulation is made public at the end of the afternoon at Montparnasse station before an enthusiastic crowd. Through their action, courage and sacrifice, the men and women of the Resistance facilitated the advance of the elements of the 2nd DB and the 4th Infantry Division for the Liberation of the Capital. Ici s'élevait la Gare Montparnasse où le 25 août 1944 à 17 heures, le Général Leclerc, commandant la 2e. D.B, a recu du Gouverneur militaire allemand Von Choltitz l'acte de reddition consacrant la libération de la capitale a l'Armée Française et au peuple de Paris. Cet acte a été également signé par le Colonel Rol-Tanguy, commandant les F.F.I. de la région parisienne en présence du Général Chaban-Delmas, du Lieutenant Colonel de Guillebon et de Maurice Kriegel Valrimont. 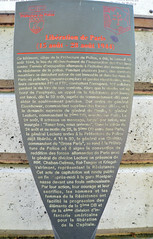 English translation: Here was the Gare Montparnasse where on August 25, 1944 at 5 pm, General Leclerc, commanding the 2nd. D.B, received from the German military governor Von Choltitz the act of surrender consecrating the liberation of the capital to the French army and the people of Paris. This act was also signed by Colonel Rol-Tanguy, commander of the F.F.I. of the Paris region in the presence of General Chaban-Delmas, Lieutenant Colonel de Guillebon and Maurice Kriegel Valrimont.